behaviors, and working positively and productively with both families and colleagues. Each chapter offers a glossary of terms and recommended books. Clarissa A. Willis is the associate director of the Center of Excellence at East Tennessee State University and an associate professor of special education in the Department of Human Development and Learning. She is the author of Teaching Young Children with Autism Spectrum Disorders and coauthor of Inclusive Literacy Lessons with Special Education Adaptations . Willis has over 30 years of experience working with children with special needs as a speech pathologist, early interventionist, teacher, and grant administrator. As a consultant, she has provided workshops and keynote addresses to schools and organizations across the country and abroad. What Do I Need to Know to Work With Children With Special Needs? How Do I Develop a Philosophy of Meaningful Inclusion? How Do I Get the Child's Family Involved? How Do Young Children Develop Vision? What Causes Visual Impairments in Young Children? How Are Vision Impairments Classified? What Resources Are Available to Help the Child Function in My Classroom? How Do Children With Vision Impairments Learn? What Determines the Degree of Hearing Loss? So, What About Hearing Aids? How Will Hearing Loss Affect Children in My Classroom? What Are Functional Skills and Why Are They Important? How Do I Teach Everyday Tasks (Functional Skills)? What Do I Do First, Before Teaching a New Skill? How Exactly Does This All Fit Together? What Are the Five Types of Autism? What Exactly Is Sensory Integration? What Can I Do to Make My Classroom Sensory "Friendly"? 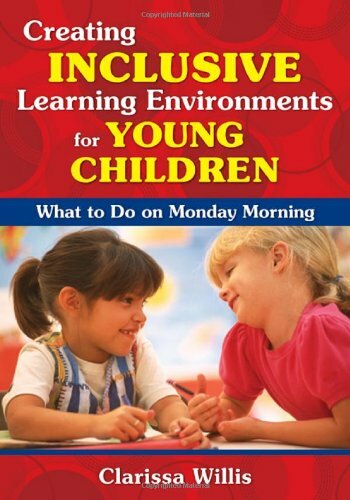 How Do I Prepare Children in a General Education Setting for a Child With Special Needs? What Kinds of Activities Teach Tolerance and Acceptance of Others? What Role Does the Curriculum Play in Teaching Children With Special Needs? Is There a Special "Curriculum" for a Child With Special Needs? What Kinds of Behaviors Can I Tolerate? How Do You Set Appropriate Goals for Communication? What About Children Who Are Nonverbal? How Do I Start Helping a Child With Special Needs Use Pictures to Communicate? What About Electronic Communication Devices?